It is not at all unusual for me to open up a client's upright piano in preparation for tuning only to discover a thick layer of dust, a handful of pencils, old business cards, and assorted trinkets that have somehow fond their way into the piano cabinet. The enormity of dust bunnies contained inside an old upright can horrify the unsuspecting. This is an area of the home that can go decades without being exposed to daylight. 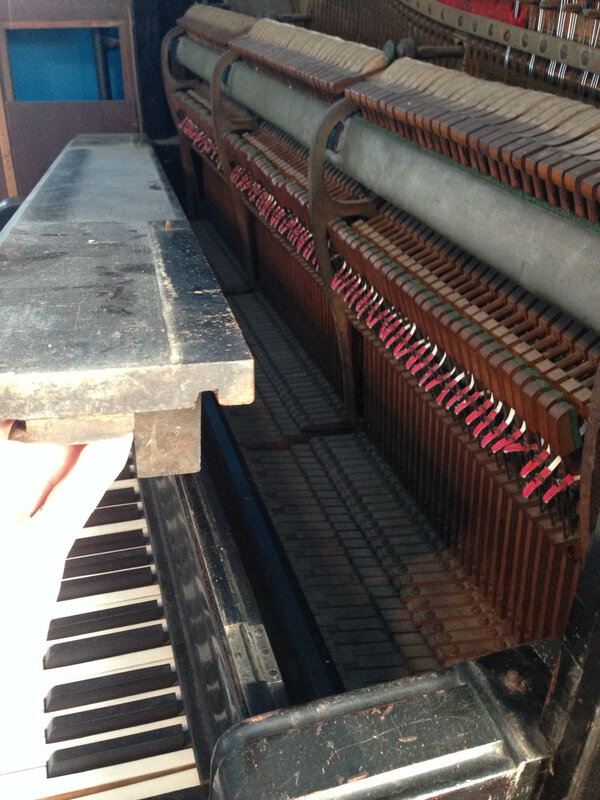 Although the inside of an upright piano is rarely seen, this kind of debris inside the piano can adversely affect your piano's function. 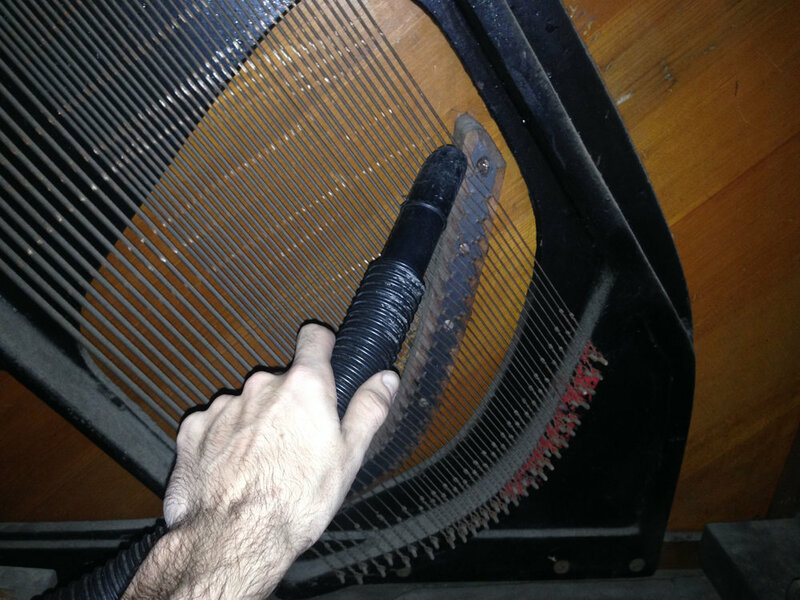 Because of this, I recommend a yearly deep clean of any upright piano. If your piano is particularly dusty, I highly recommend wearing a dust mask or respirator. If you find any rodent droppings in your piano, please read my post about Hantavirus before continuing. Lift the lid. Some pianos will have a hinged half-lid like this one. 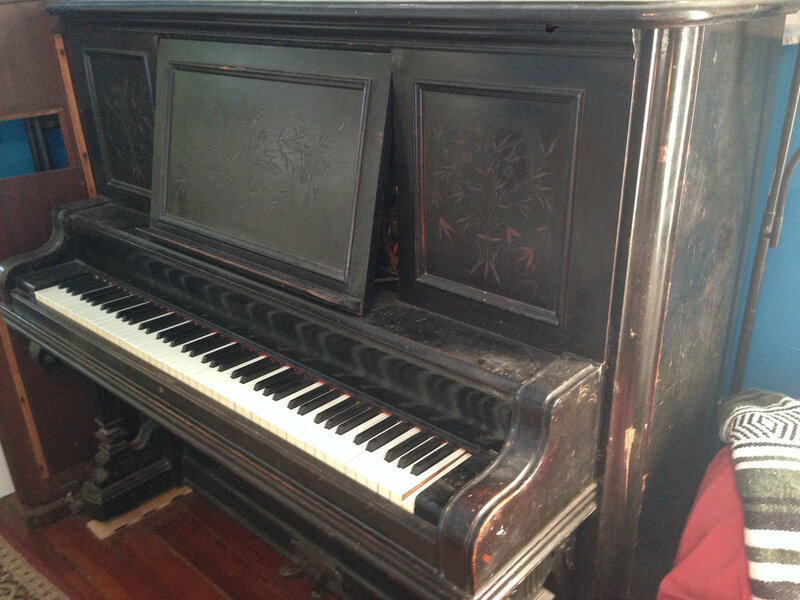 Some will have a hinged full lid that you can lean against the wall behind the piano. Very occasionally, I will come across one that has the lid hinges at one end of the cabinet, instead of in the back. Often times upright lids will have a small "catch" that will require you to give a firm pull upward on the lid in order to pop it loose. 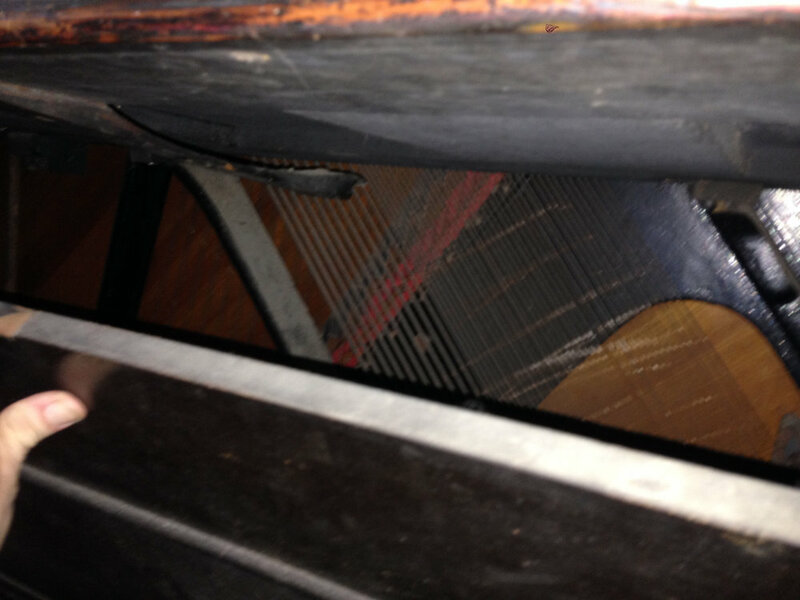 The front panel of the piano can now be removed. Both the left and right sides of the cabinet will have either a protruding metal pin covered by a small wooden latch, or a protruding screw secured by a small metal latch. Open the latch and tilt the front panel toward you. Grab it by both ends and lift it out the piano. Some studio uprights won't have any latches. 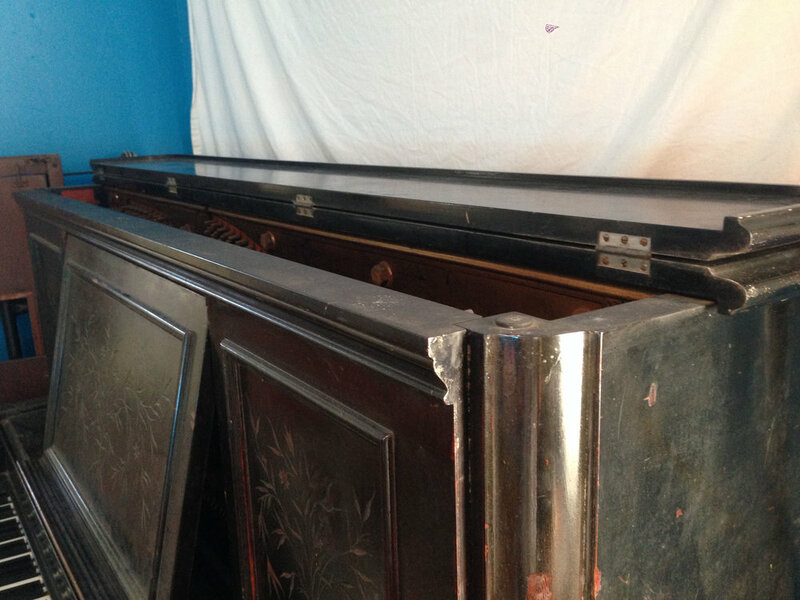 The front panel of these pianos will simply lift up and out of the cabinet. 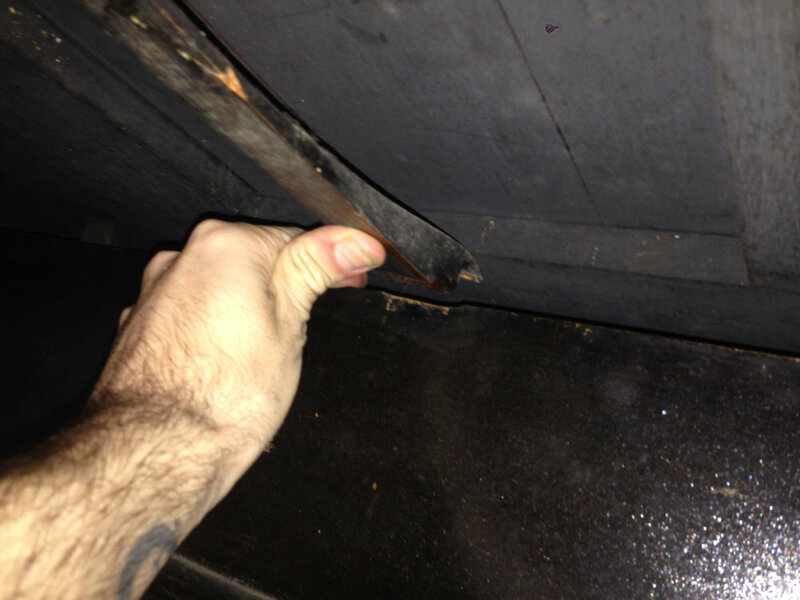 Using a vaccum, remove any accumulated dust from on top the the hammers and dampers. You can also vacuum around the tuning pins. The next step is where there will be the most variation between pianos. 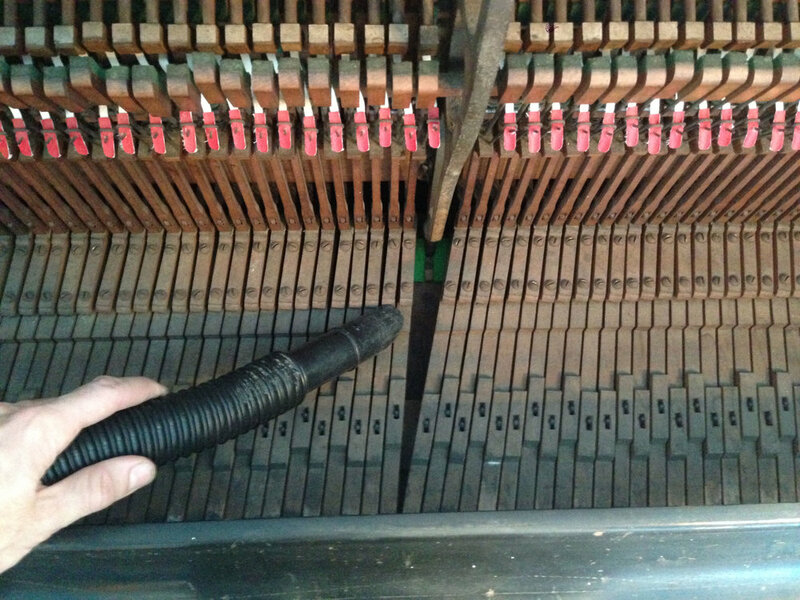 A spinet piano may be sufficiently disassembled for deep cleaning at this point, while an older studio upright may still have several steps to go. If you can vacuum the tops of and in between the keys, you have disassembled far enough. If not, you will need to remove more cabinet parts. Some large upright have a decorative column on each end. Remove the two large screws holding these columns to the cabinet, and set the columns aside. The next part to remove is what I like to call the "sill". This is the horizontal board just above the fallboard (the piece that covers the keys when the piano isn't in use). This will also often be secured with a large screw on each end. Remove the screws and remove the sill. No matter what kind of upright you have, you should at this point be able to see the full lengths of the keys and be able to remove any debris that has accumulated on top of them. The next step is to remove the lower panel. This is usually secured with one or two metal springs. 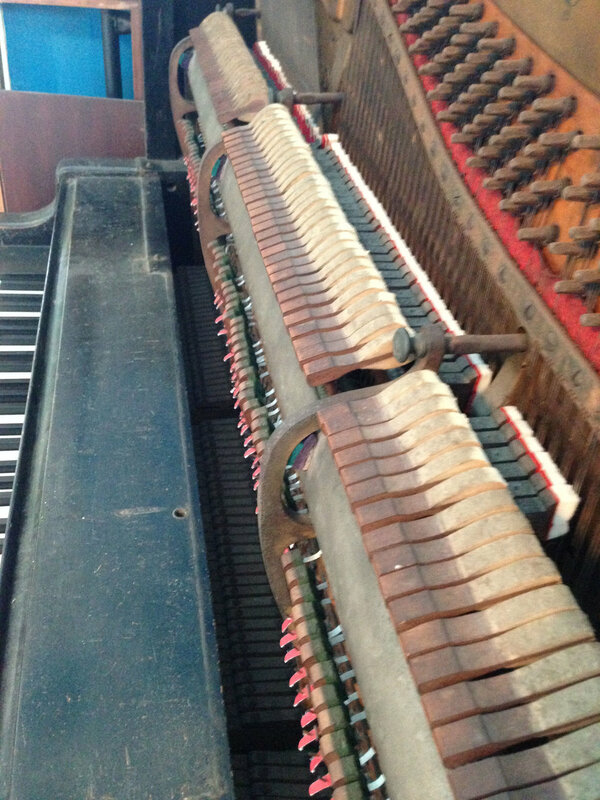 The piano in the photo actually uses a wooden spring. Push upward on the spring(s) and pull the lower panel towards you. Once the lower panel is removed, run the vacuum along the strings, bridges, and hitch pins. 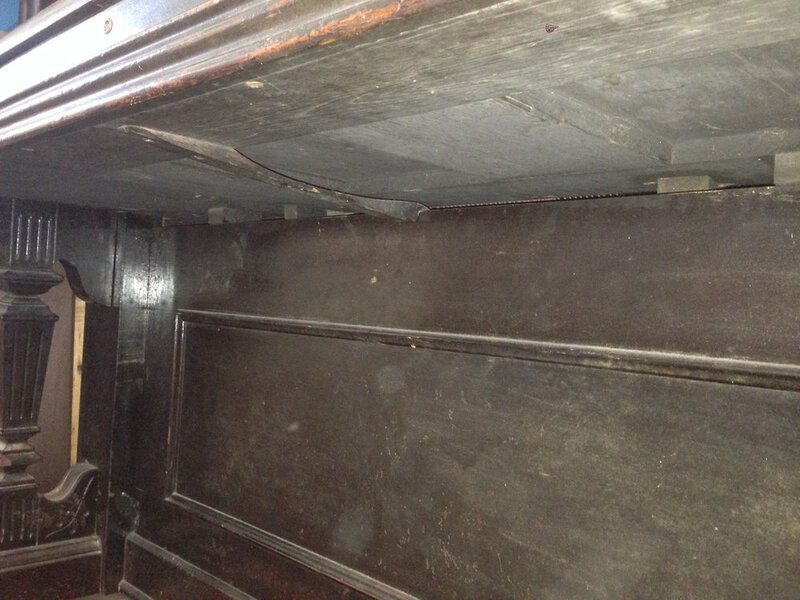 Remove any large debris from the bottom board of the piano and continue vacuuming around the pedal brackets and into the corners of the cabinet.